Here you’ll find a list of my professional publications from 1994 to the present. Most of them anyway. I haven’t listed out every magazine article or short piece because this was long enough already! Dwarf Warfare (Author), Osprey Publishing, January 2016. Dungeons & Dragons: Out of the Abyss (co-designer), Wizards of the Coast, September 2015. Dragon Age RPG Core Rulebook (lead designer), Green Ronin Publishing, August 2015. 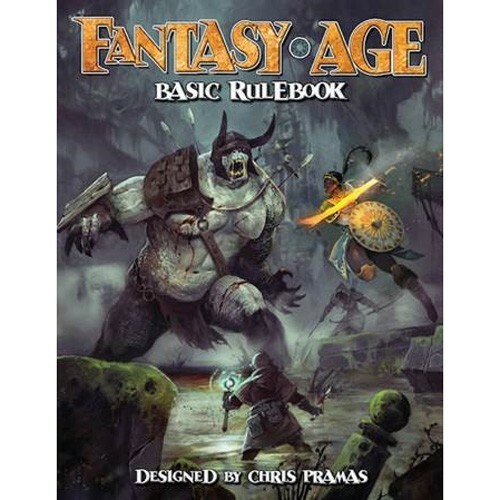 Fantasy AGE Basic Rulebook (lead designer), Green Ronin Publishing, August 2015. Titansgrave: The Ashes of Valkana (developer, co-designer), Green Ronin Publishing, August 2015. The Grande Temple of Jing (co-designer), Hammerdog Games, August 2015. Orc Warfare (Author), Osprey Publishing, June 2015. Freeport: The City of Adventure (creator, co-designer), Green Ronin Publishing, March 2015. The Kobold Guide to Combat (co-author), Kobold Press, November 2014. Dragon Age RPG, Set 3 (lead designer), Green Ronin Publishing, October 2014. The Emerald Spire Superdungeon (co-designer), Paizo Publishing, June 2014. Hillfolk RPG (designer, Brigade series pitch), Pelgrane Press, August 2013. The Kobold Guide to Worldbuilding (co-author), Kobold Press, January 2013. Dragon Age RPG, Set 2 (lead designer), Green Ronin Publishing, July 2011. Family Games: The 100 Best (co-author), Green Ronin Publishing, March 2010. Pathfinder Chronicles: Guide to the River Kingdoms (co-designer), Paizo Publishing, March 2010. Dragon Age RPG, Set 1 (lead designer, developer), Green Ronin Publishing, February 2010. Descent: Quest Compendium (co-designer). Fantasy Flight Games, August 2009. A Song of Ice and Fire Roleplaying (game concepts), Green Ronin Publishing, March 2009. Shades of Empire (developer, co-designer), Fantasy Flight Games, January 2009. Warhammer 40,000: Dark Heresy (co-designer), Games Workshop/Black Industries, January 2008. The Pirate’s Guide to Freeport (creator, co-designer), Green Ronin Publishing, August 2007. Hobby Games: The 100 Best (co-author), Green Ronin Publishing, August 2007. Crisis in Freeport (co-designer), Green Ronin Publishing, August 2006. Children of the Horned Rat (co-designer), Games Workshop, June 2006. Spires of Altdorf (developer), Games Workshop, September 2005. Freeport Trilogy (creator, co-designer), Green Ronin Publishing, August 2005. Sigmar’s Heirs (developer, co-designer), Games Workshop, August 2005. Old World Armoury (developer), Games Workshop, July 2005. Ashes of Middenheim (developer), Games Workshop, May 2005. Old World Bestiary (developer, co-designer), Games Workshop, April 2005. Plundered Vaults (developer), Games Workshop, March 2005. Warhammer Fantasy Roleplay, 2nd Edition (lead designer, developer), Games Workshop, March 2005. Creatures of Freeport (developer), Green Ronin Publishing, May 2004. Nocturnals: A Midnight Companion (co-designer, developer), Green Ronin Publishing, April 2004. Medieval Player’s Manual (developer), Green Ronin Publishing, March 2004. Book of Fiends (co-designer), Green Ronin Publishing, February 2004. Psychic’s Handbook (developer), Green Ronin Publishing, January 2004. Torches & Pitchforks: The Card Game of Monster Movie Mayhem (editor, flavor text), Green Ronin Publishing, October 2003. Testament: Roleplaying in the Biblical Era (developer), Green Ronin Publishing, July 2003. Fang & Fury: A Guidebook to Vampires (developer), Green Ronin Publishing, June 2003. Black Sails Over Freeport (developer), Green Ronin Publishing, January 2003. Plot & Poison: A Guidebook to Drow (developer), Green Ronin Publishing, November 2002. Book of the Righteous (developer), Green Ronin Publishing, August 2002. Shadow of the Drow (co-designer), Wizards of the Coast, July 2002. Hammer & Helm: A Guidebook to Dwarves (developer), Green Ronin Publishing, July 2002. The Ghostwind Campaign (Creative Director, lead designer), Wizards of the Coast, June 2002. Fire and Ice (Creative Director, co-designer), Wizards of the Coast, April 2002. Freeport: The City of Adventure (creator, lead designer, developer), Green Ronin Publishing, March 2002. Secrets of Magic (author of short story Burning Vengeance), Wizards of the Coast, March 2002. Blood and Darkness (Creative Director, co-designer), Wizards of the Coast, January 2002. Arcana: Societies of Magic (developer), Green Ronin Publishing, December 2001. Dungeons & Dragons: Chainmail (Creative Director, co-designer), Wizards of the Coast, October 2001. Jade Dragons and Hungry Ghosts (co-designer), Green Ronin Publishing, September 2001. Hong Kong Action Theatre, 2nd Edition (co-designer), Guardians of Order, July 2001. Legions of Hell (designer, art director), Green Ronin Publishing, May 2001. Madness in Freeport (developer, art director), Green Ronin Publishing, March 2001. Terror in Freeport (developer, art director), Green Ronin Publishing, December 2000. Death in Freeport (designer, art director), Green Ronin Publishing, August 2000. The Final Church (co-designer), Wizards of the Coast, June 2000. Slavers (co-designer), Wizards of the Coast, April 2000. The Apocalypse Stone (co-designer), Wizards of the Coast, February 2000. Realm of Chaos (author of short story Mormacar’s Lament), Black Library (Games Workshop), January 2000. The Vortex of Madness (designer), Wizards of the Coast, January 2000. Dragon Fist (designer), Wizards of the Coast, November 1999. Guide to Hell (designer), Wizards of the Coast, October 1999. Into the Maelstrom (author of short stories Into the Maelstrom and The Black Pearl), Black Library (Games Workshop), September 1999. Magic the Gathering: Urza’s Legacy (flavor text), Wizards of the Coast, February 1999. Star Trek: The Next Generation RPG (co-designer), Last Unicorn Games, August 1998. Blood of the Valiant: The Guiding Hand Sourcebook (designer), Ronin Publishing, March 1998. Forgotten Lives (co-designer), Atlas Games, December 1997. Heaven and Hell (co-designer), Steve Jackson Games, October 1997. The Book of Hunts (co-designer, editor, developer), Ronin Publishing, June 1997. Marked for Death (co-designer), Daedalus Entertainment, July 1996. Dying of the Light (co-designer), Hogshead Publishing, December 1995. Underground Companion (co-designer), Mayfair Games, 1994. Underground Player’s Handbook (co-designer), Mayfair Games, 1994. Periodicals: Articles and short stories for Dragon, Inferno! (Games Workshop), Arcane, Game Trade, Shadis, Pyramid, Valkyrie, MARS, The Familiar, and Wargames Illustrated. Hmm, I don’t know. I don’t even have a copy. I expect it’ll eventually be released on RPGNow, but after they work their way through D&D stuff. I loved the Dark Matter setting for Alternity. I think I have a copy of the Final Church somewhere but if I recall correctly it only was ever released digitally. I can’t legally sell that. Contact WOTC, I did when I lost a PDF I bought on RPGNOW after they stopped selling there the first time and they sent me a copy. Yes, Elf Warfare is next. I finished it not too long ago. Do you know if and when the Elf Warfare book will be released as PDF? It should be. I don’t know when though.